We download lots of Linux distributions from Internet for testing purposes, but many times what happens is download manager crashes and downloads get halted. In some instances someone from our family or a friend shuts down the download manager when they are using my desktop, so all this becomes a real pain for us. 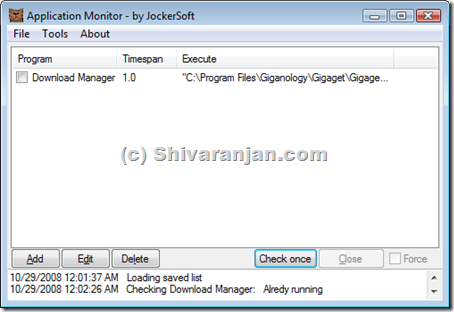 Application Monitor is free utility which continuously monitors the application that you want to have monitored, if gets closed or crashed then it automatically restarts the application. Monitors and restarts an application in the event it gets closed or crashed. The periodicity applications can be set. In case of application error alerts can be received in form of e-mails immediately or based on time intervals. Option to start automatically with Windows. All events are logged in log file which can later be used to analyses the details. Does not require installation hence can be run from portable USB flash drives. We tested this application in Windows XP and Windows Vista.